— Comments Off on Changes in Federal Spending: How should performance auditors respond? Changes in Federal Spending: How should performance auditors respond? For the past 40 years, the Congressional Budget Office has been issuing independent, non-partisan projections of federal spending. Why do you need to know this? Because state programs often depend on federal support. If federal support falls, it will have a major impact on the programs you evaluate. You can help your state avoid costly decisions down the road by preparing for these changes now. The short story of CBO’s projections is that federal support for medical programs will expand and discretionary spending will shrink in the future. CBO projects that the share of federal spending on medical programs will increase by approximately 70 percent over the next 25 years. 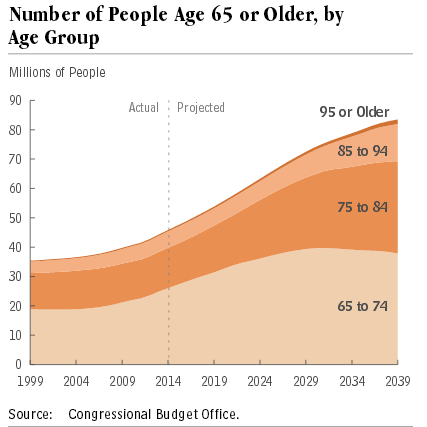 CBO notes “the number of people receiving benefits from government programs will increase sharply during the next two decades”. Key medical programs include Medicaid, Medicare, Children’s Health Insurance Program (CHIP), and health insurance subsidies as part of the Affordable Care Act (ACA). What is driving up medical costs? According to CBO, there are three primary drivers: 1) an aging population requires more medical care; 2) medical costs continue to grow faster than inflation; and 3) the expansion of Medicaid under the ACA and its related subsidies. Aging accounts for roughly 55 percent of the growth, increasing medical cost inflation per beneficiary accounts for 24 percent, and the ACA accounts for the remaining 21 percent. On average, the federal government pays 60 percent of the costs of Medicaid. As medical costs continue to grow, states will also face rising expenses for their 40 percent match. CBO predicts that many state governments will manage rising Medicaid costs by restraining the rates paid to providers, limiting the services they choose to cover, or tightening eligibility to reduce the number of beneficiaries. Since the 1970’s discretionary spending has been falling. CBO believes this trend will continue for decades to come. What used to amount to half of federal spending has declined to approximately a third in recent years. Over the next few decades, it will decline even further. Discretionary spending spans a wide array of government programs. The list of programs is too exhaustive to name them all, but they include areas such as education, workforce development, social services, transportation, housing, research and public health, criminal justice and natural resources. It’s likely you see at least one program in your workload that will face challenging fiscal times in the future. What does this mean for performance auditors? Auditors should consider these projections within the context of their work. 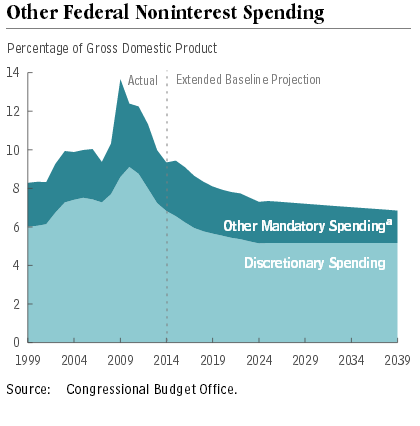 Programs with declining federal support are at risk for fiscal problems in the decade to come. By evaluating these programs, such as those in natural resources, with the view that funding will dry up we can make recommendations to get their fiscal house in order, before the roof collapses. For medical programs, look for fraud and waste. Gear your evaluations around cost effectiveness and tie outcome measures to program costs. As states take on an increasing financial responsibility over the ACA expansion, also consider how this might pose new fiscal challenges for your state. A key legislator in Oregon recently said that two thirds of increased revenue in the next budget cycle are being directed to Medicaid. That leaves few dollars on the table for other programs with growing expenses. Long-term forecasts are subject to a high degree of uncertainty. Keep in mind that these numbers can and will change. For example, if a new cost-effective cure for cancer is developed in the next decade, this will have a major impact medical spending. Changes in law will also have a major impact on these projections. For example, if the Supreme Court or a future congress repeals provisions of the ACA it will dramatically change how much money is spent by the federal government on Medicaid. Only 24% of the Oregon community college students completed an associate’s degree or certificate, putting Oregon’s education and workforce goals in jeopardy. Community colleges have introduced sound practices to improve student success, but they reach less than one-quarter of the students in need. Coordination, support and analytic capacity are needed to improve student success and to assess proposed changes, such as outcome-based funding. Congratulations to our very own Jamie Ralls, Sandy Hilton, Ian Green and Scott Learn! An audit released last April on Oregon’s Temporary Assistance for Needy Families, better known as TANF, was selected as this year’s winner for a national award on excellence in accountability. You can read the complete audit here! The Excellence in Accountability Awards are distributed annually by the National State Auditors Association. This year, from a pool of 34 entries across four categories, the Oregon Audits Division took home the prize in large performance audits. After interviews, extensive data analysis and reviewing more than 80 cases in-depth, the audit found that, despite budget cuts and increased workload, Oregon’s TANF program continued to successfully help dozens of clients across the state. However, the audit also found that the program was making little to no progress in moving its clients toward self-sufficiency. Auditors identified opportunities for improvement that would help keep Oregon’s TANF program on steady ground. The award will be presented at the 2015 NSAA Annual Conference in Little Rock, Arkansas in June. This marks the first time the Oregon Audits Division has won this award. Congratulations to the team and to the other winners!